Top flight German turbine maker, Siemens booked a €223 million write down (ie loss) in 2014 due to the fact it had to replace bearings in a fleet of turbines that were less than 2 years old. Siemens talking about the loss said: “The charge is related to inspecting and replacing bearings due to the early degradation in certain turbine models. We believe this is related to recent batches of bearings and we are in discussions with the supplier” (see our post here). Siemens aren’t having any better luck closer to home. In Denmark, the Ørsted offshore wind farm at Anholt was completed in 2013. Barely 5 years later and the turbines’ blades are so worn out that hundreds of them need to be dismantled, returned to dry land and repaired. We are trying to collect dilute erratic energy, spread over hundreds of square kilometers in windy, salty, and wet conditions with machines that’s blade tips spin at 330km/hour. What could possibly go wrong? Early retirement in an industry that was never designed to last. 3 months ago, I saw a documentary about these wind turbines and the risk of collapse of any number of them. And now one of them breaks. Quite a coincidence since in the documentary, they talk about the cracking of the grouting between the base of the turbines and the steel underwater base pipe. And as that happens with one of the turbines, followed by any number of other turbines, the turbine will sink into the space where the grouting once was. Then short of closing the gap completely, relatively small narrow brackets in the base of the turbine will settle on the steel base pipe. Since the brackets are not designed to hold the turbine in place on the steel base pipe, they will break soon or later and then there will be absolutely no support on the side around between the base of the turbine and the steel base pipe. And the entire turbine will just fall over. Once that happens to one of the turbines, others will soon follow. They also say that repairing the turbines would cost 82 million (U.S.) dollars… Each! Exposure of the fraud. Good disclosure. How much CO2 goes in to making and installing a turbine?, how much CO2 is saved by each turbine per annum? Latest figures from Germany show emissions increasing, we have a post coming up soon on that topic. Nuclear power is the only technology that can claim 50 to 80 years of operational life in existing plants. Future meltdown proof designs will last even longer with no long lived weapons waste namely plutonium. The US Congress has several bills in process to build these advanced designs in the USA however the States need to support their siting in the footprints of closed coal plants. NIMBYism should not be an issue since the brownfield coal sites need to be cleaned up any way. Korea is anti wind. Not only bees killed. This is caused by infra sound at blade tips. People get sick too. Solar mirrors produce power 24/7, too easy!! We Have the Ways!!! Sadly Not the Will!! “Solar mirrors produce power 24/7” wait, what??? what about the part when the sun is not shining on them??? California … 15,000 of these toys produce 1% of their flower power. The cost output ratio??? Con me!! Nicolai Tesla found the answer a hundred years ago.. little money in that! Big oil and motor killed that..
Ah, the market killed that, if you’re talking about the motor car? i have been in machining metals and electronics for 50 years now and never saw anything so badly designed as windmills. these mechanical monsters were deemed obsolete in the 70s but someone figured out how to sell pollution intensive junk to the dumbed down masses. now there is a cheap easy way to bring these down if they’re killing wildlife or messing with your head due to low frequency thumps. a little more info and i will have a mix that hardens the steel by just contact with a section. hard steel starts cracks and the twisting motions makes it go faster. look to steel hardeners like carbon to bring down a windmill and you do not need to spend even a minute at the site. As ever mushrooms are fed and kept in the dark .. in a world run by children, one expects no less. 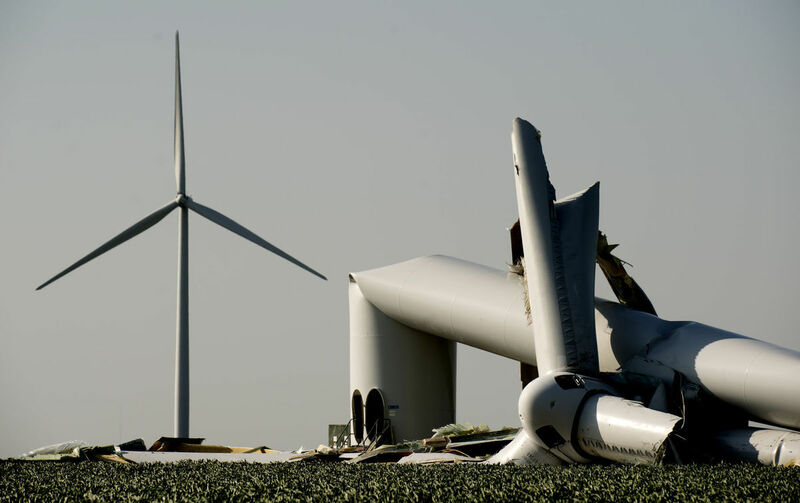 Here in Ontario we are just beginning to see the early failures of wind turbines and their components…our oldest wind turbines are about 15 years old, so stand by! Perhaps Tim Flannery who sits on the Siemens Sustainability Advisory Board should come clean, tap into his mammalian expertise and let them know that their turbines are really white elephants?